As every gambling game increases its popularity in terms of the land casinos evolution and the forthcoming development of internet casinos, there're usually created numerous myths concerning it. These are, on the one hand, completely harmless, but, on the other hand, can disorient the beginner. MYTH 1. A player's acute observation and effort will help him/her notice certain patterns, in which the cards are distributed. In Reality: Due to baccarat's being a game of luck, in none of its alternations during the whole baccarat history any of the patterns were ever detected. MYTH 2. The usage of betting systems will help any player win more. In Reality: Any known system of betting (such as the Fibonacci System, for instance) is proved to work, as all baccarat variations are games of chance. MYTH 3. A player should raise the bet if the initial "natural" (a cards' total value of 8-9) comes. In Reality: Each round of the game is quite unpredictable, so no one knows, whether high- or low-value cards will come next. MYTH 4. Card counting is as suitable for baccarat, as for blackjack. In Reality: There's no point in counting cards, no matter what baccarat variation is concerned, as the cards, which have already been used in a game, are frequently shuffled with the others again. MYTH 5. 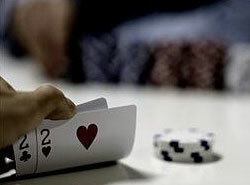 No player can get "natural", playing baccarat in online casinos. In Reality: There're records of receiving a "natural", while gambling on the internet sites. MYTH 6. Self-confident players win more. In reality: The level of one's self-confidence affects the game's outcome in NO WAY, as the essence of all baccarat variations lies in guessing. MYTH 7. One can play baccarat only if he/she's rolling in money. In reality: Present-day online casinos offer $2 - $5 bet minimums. All things considered, there will, undoubtedly, arise more baccarat myths in future. Nevertheless, one can prevent him/herself from being influenced by them, following a simple rule: As long as information presupposes an existence of consistent patterns or a certain player's strategy in a game, it's definitely just a mere myth, as BACCARAT IS A GAME OF LUCK!